A knife with inferior steel is a waste of money. But paying too much for blade steel when you don’t need it may also be wasteful. What steel will work best for your cutlery needs? Don’t overlook A2 for your next knife. Kill an elk, and your hunting buddies gather round to help haul it out to the nearest road. But first it has to be gutted, and these same friends are happy to critique your knife handling skills and advise you on better gutting, skinning etc. techniques. I split the ribcage on this bull elk with a Bark River Sahara with an A2 steel blade. 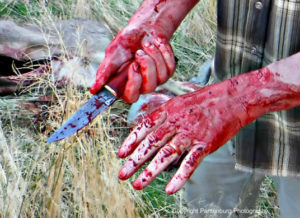 That was the situation when I killed my last Oregon bull elk. My Bark River Sahara did a fine job of gutting the large animal. Then I decided to see if the ribcage could be split, using just a knife. All of us were surprised when that knife went through the ribs with minimal effort. The Sahara was used for cutting off the lower legs, and later, to skin and cut off the head. The A2 steel in the blade held its edge very well, and could have easily handled another bull. Knife steels have improved radically since I got my first sheath knife, a Western I-66. That blade was probably 1075 to 1095 high carbon steel and it worked very well. I love my Cold Steel SRK. I got mine in 1991, shortly after it was introduced on the market, and carried it for 20 years. The knife field dressed about 50 deer and was used on elk. That steel was Carbon V.
Then I discovered A2 steel blades, and found out what I was missing. 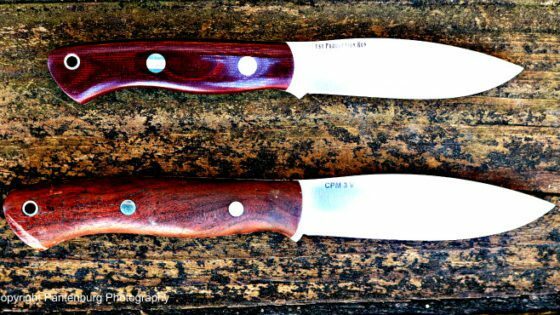 The superb Cross Knives and Jesse Hemphill knives frequently use A2, and several of them performed really well. I used several Bark River knives with A2 blades, and then, like many users, upped my game (I thought) to CPM 3V. Then I had to try Elmax, CPM 4V and then CPM Cru-Wear. I field dressed a mule deer buck with a Jesse Hemphill custom Damascus blade. I tried out many other quality steels. And these super steels worked very well. But recently, I asked Jesse Hemphill to make me custom user knife, based on the Canadian leaf style blade, and a thick micarta handle with a short quillon. The blade was to be A2. 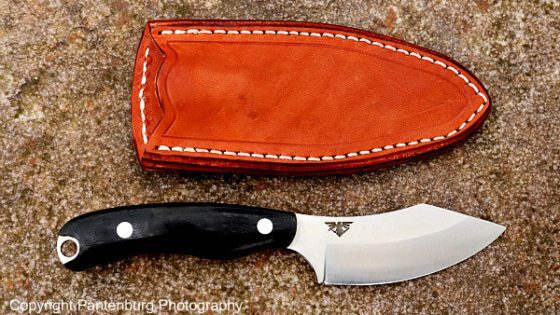 This knife is the prototype for the Survival Common Sense knife. As such, the SCS will be the recommended hard use knife for Big River Wild Adventures. This knife will have a hard life, under frequently wet and nasty conditions. It will be used for wood carving, food preparation, cleaning fish and possibly (in season) wild game, and all the tasks associated with wilderness survival. This Jesse Hemphill Custom Damascus worked very well in the field. Why A2 when there are many, many other choices? And what exactly is A2 steel? Here are several reasons to consider A2 for your next knife. Cost: Check out the cost of an A2 blade versus one in CPM 3v, Elmax, Cruwear or any number of super steels. Quality Damascus can run upward of $55 per inch, making the cost, IMO, prohibitive for a user knife. (Also, you better get your Damascus steel from a reputable maker – some of the imported stuff is pure junk.) An A2 blade will typically be at least 25 to 30 percent cheaper than the same knife in a super steel. 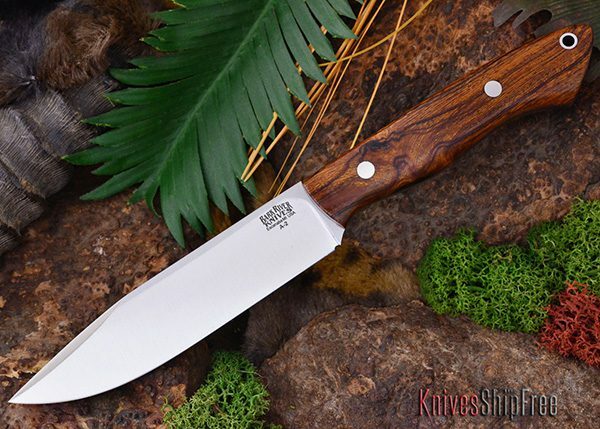 This Sportsman is my most-used Bark River knife. The steel is CPM S35VN. Handling: I test knives by using them for their intended purpose. 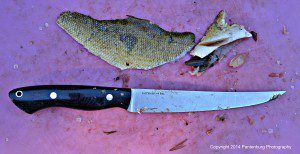 In the case of hunting or fishing knives, I do my best to wring them out on wild game or fish. Since I go hunting and fishing, and not killing or catching, there are some times when I get blanked. In that case, I may go to a meat processing facility and try the knives out. The knife must have the correct design for the job, but a well-designed knife with crappy steel is a waste of time and money. If you have to work harder, because the blade keeps getting dull, that could be dangerous. 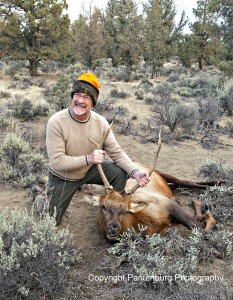 Edge-holding ability: For almost 20 years, I carried sharpening gear on backcountry elk and deer hunts in Idaho. But that was before I discovered the super steels. Today, the sharpening gear stays in camp. On multiple occasions, I have gutted, skinned, quartered, removed the lower legs and cut the head off whitetail deer with an A2 knife. I’ve never needed to stop and re-sharpen. I’ve also done this with CPM 3V, Elmax and Jesse Hemphill Damascus steel. Frankly, I can’t tell that much difference in edge retention between A2 and these other steels. At the end of the day, I want a knife that can handle a big game carcass without the hassle of having to stop to re-sharpen. A2 gives me that. Ease of sharpening: Use a knife enough, and it will have to be sharpened. I don’t want a super steel that is so hard it can’t easily be sharpened in the field if necessary. Despite A2’s excellent edge-holding ability, I find it easier to sharpen than CPM 3V. The harder and tougher the steel, the more difficult it is to sharpen. I have sharpening OCD, though, and I maintain knife edges. But if my A2 knife has been used at all, a quick strop is all it ever needs to maintain a wicked edge. Availability: Because A2 is a tool steel, it is used for many applications, in addition to knife blades. That means A2 is common, easy to get, and affordable. Maintenance: A2 will build up a patina with repeated use. It is not stainless steel. Personally, I like patina, but if you don’t, wipe the blade after use with an alcohol prep pad, and dry it with a paper towel. I don’t have a problem with A2 rusting, even though I live in a very hot, humid climate. I don’t know how much you want to spend on a knife. But a couple of decades ago, I had a wife and three small kids that ranked higher than quality hunting knives in the household budget. I bought a knife I could afford at the time. 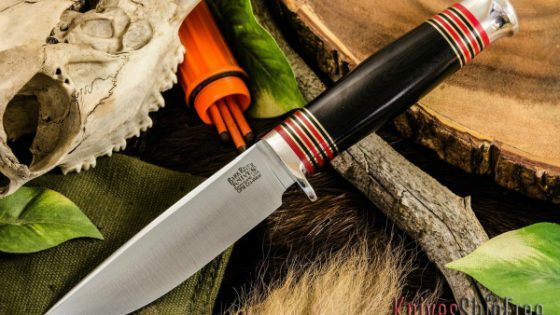 If you are looking for an affordable, quality hunting or bushcraft knife that won’t break the bank, take a hard look at A2 steel. It won’t let you down.